This month's Virtual Book Club for Kids author is Aliki, who has such an amazing collection of books to chose from. 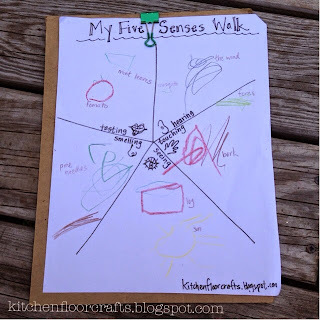 We decided to use the book My Five Senses. 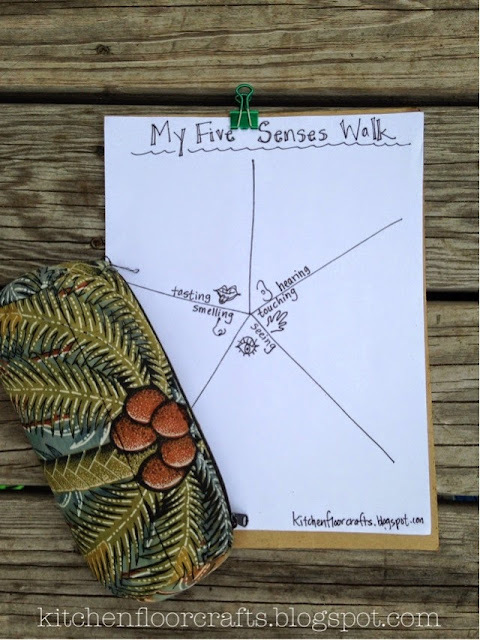 This book and activity is one I've loved combining over the years. 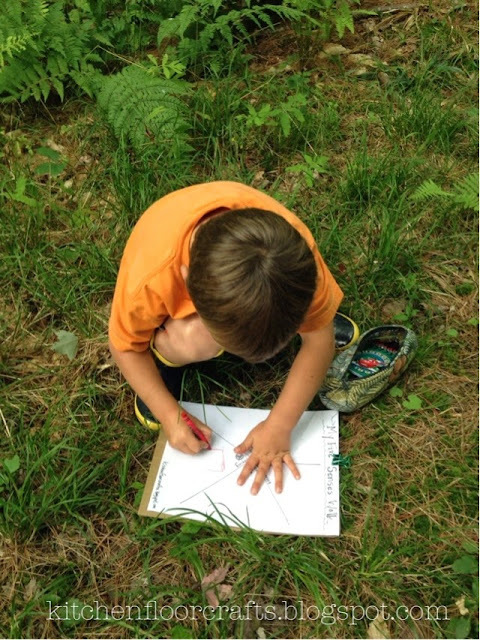 Recently we read the book and did the activity at the preschool nature camp I ran, so we were excited to do it again. 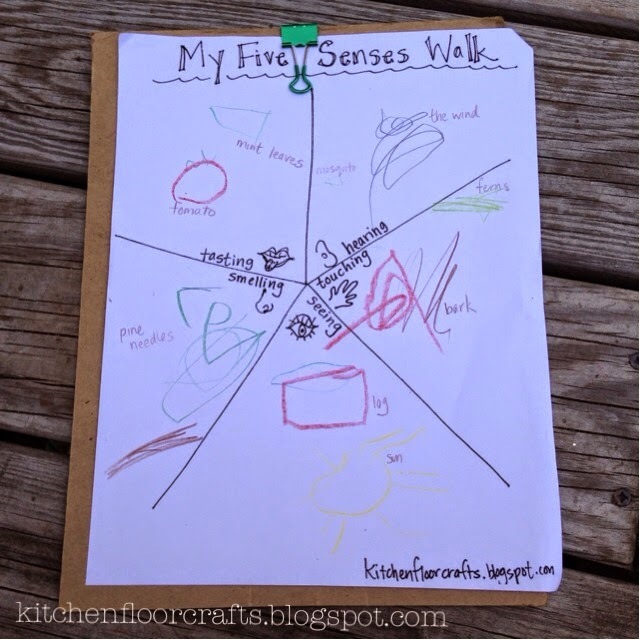 In a clear, easy to understand way Aliki introduces kids to each of the five senses and gives examples of how we use them. Kids connect to the illustrations and how the examples fit their everyday lives. What's great about this activity is it can take as long or as little as you have time for. 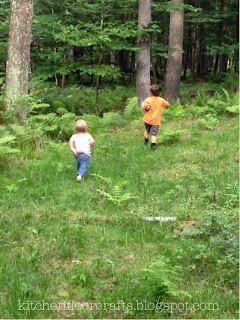 With our free printable you can do it almost anywhere from a city park to a hike through the woods. In fact, it would be fun to do it in a variety of places and then compare the different pages. Big Brother had heard the book and done the same activity at the camp, so for this post it was a second read and second walk. He loved doing it again, and his knowledge and understanding only grew. The materials include our free printable (one page divided into five sections, one for each sense) and some kind of coloring material. Big Brother recently loaded this pencil case with supplies for "school" so he decided to bring his case. After reading we headed out on our walk. For our Five Senses Walk we headed into the woods behind our house. As soon we started out Big Brother got excited because he realized he could hear the wind. But he wanted to wait until he "saw" something to start drawing. Although there was lots to see, Big Brother decided to draw some logs we could see on the side of the trail. He stopped near the logs and quickly drew the logs in the "seeing" area of the paper. He also added in the wind he had heard in the "hearing" section. 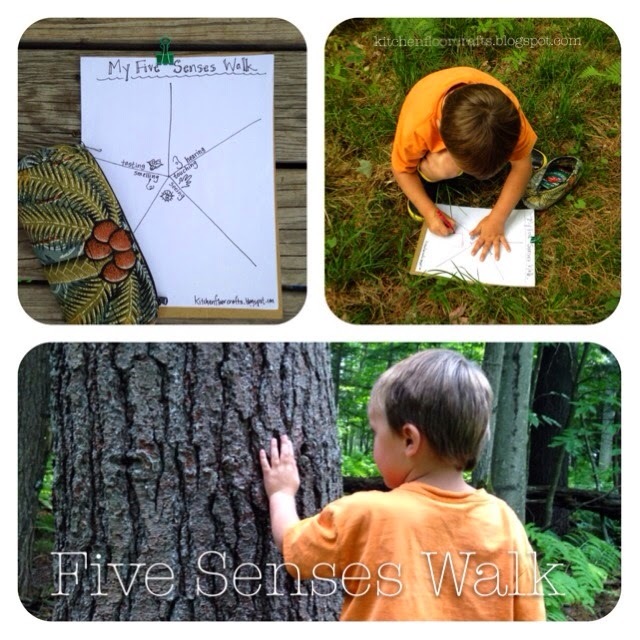 As we walked the trail he continued to explore using different senses. 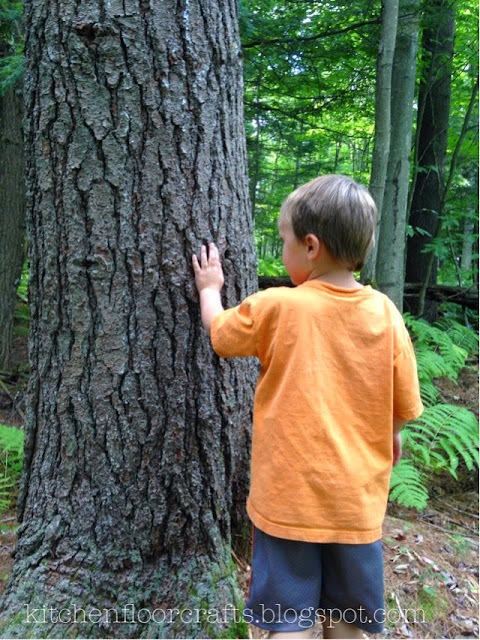 For touching he felt some rough bark and then soft ferns. Smelling was a lot of fun. He smelled dirt, a rotting log, and pine needles. 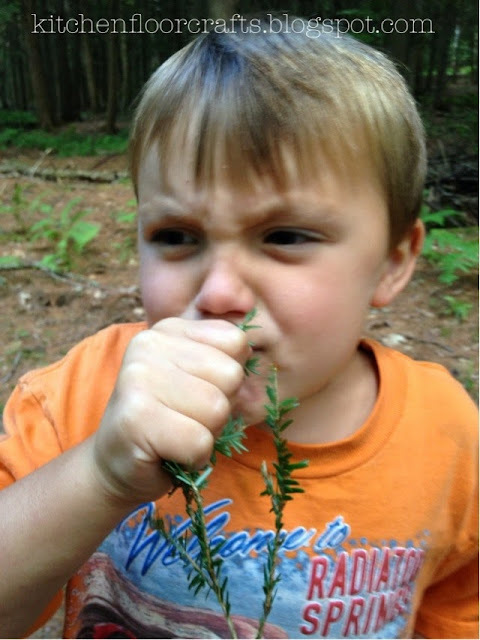 This picture is blurry, but I couldn't resist how funny he looked smelling the pine needles. It's important to make sure kids know they need to check with an adult before tasting anything on a walk. As an adult, it's important to think about what you can explore on a walk that you can taste. 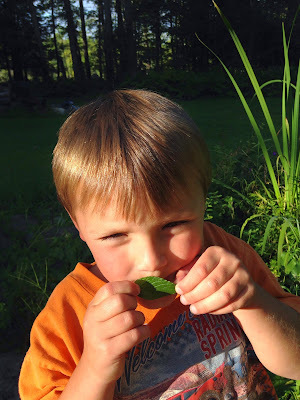 In our case, we made a stop in our gardens and sampled some mint and cherry tomatoes. If you were not going to find something edible on the walk, than you could bring along a special snack. When we returned from our walk Big Brother had at least two things in each section. I labeled them so we could remember what they were. Although Little Brother was not able to draw yet, we helped him explore his senses too by encouraging him to touch, hear, smell, look and taste. Have you seen some of our other Virtual Book Club for Kids posts? They're full of ideas for engaging with and extending books. Or check out some of the other great Aliki ideas in the linky below!